Fairway is well known in the New York tri-state area for being a top of the line gourmet and specialty grocery food store. In addition to being known for carrying specialty foods most supermarkets don’t have, Fairway is also known for being an active local community supporter and environmentally friendly. Fairway Markets are also known for their cafes and hot prepared foods with seated sections where shoppes can enjoy a meal. In 1933, Nathan Glickberg opened a small fruit and vegetable stand to provide for his family. Over the years the stand’s operations expanded and grew, allowing Nathan and his son to open their first store in 1954. The store they opened on 74th and Broadway in New York’s upper west side is still in operation today. This store features a full grocery section with a cafe serving breakfast sandwiches, and steaks by night. In 1995, the Harlem Fairway Market opened with more space per square foot. The specific store also contains a “cold room” for frozen goods (meats, dairy, beer) and provides coats that hang nearby for customers to stay warm while shopping in it. By 2009, three more stores had opened in Long Island and New Jersey. In 2010, Fairway opened a store in Westchester County that was previously occupied by Kmart. This location occupies 75,000 square feet. 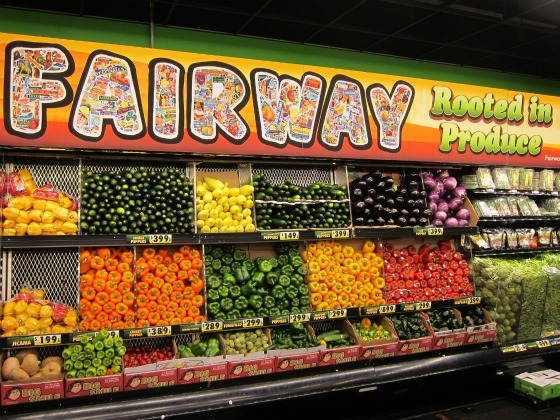 By this past October, in 2013, Fairway has opened 14 locations in the Tri-state area including New York City, Long Island, Westchester County, New Jersey and Connecticut. Fairway partners yearly with local food banks, donating thousands of pounds of food. In 2011, Fairway donated more than 2,500 turkeys for the Thanksgiving holiday. After the events of September 11, 2001 in New York City, Fairway Market teamed up with firehouses and firefighters, providing them with food throughout the lengthy rescue and clean-up. Following there quick rush to aid and help during hardships, after Hurricane Sandy in 2012, Fairway kept stores open and delivered food and cleaning supplies to people in need. Fairway’s Red Hook, Brooklyn store was awarded the U.S. Governments “Energy Star Chip” award for conservation efforts in 1998. Fairway was recognized as one of the top 50 retailers by The Gourmet Retailer in 2010. Fairway always maintains focus on keeping the best and high quality goods in store, while being environmentally friendly using method to reduce waste, recycle, green technology and organic products.